Ladders are used for convenient access to higher and lower levels everyday, especially when the use of scaffold or working platforms is not practicable. It is important to realise that many serious injuries result from falls from ladders. In the eight years frmo 1 July 2003 to 30 June 2011, 37 workers died following a fall from a ladder. In completing the risk assessment in using the ladder and accessing a roof, the type of task, duration and physical surroundings must be taken into consideration. To help manage the above risks, each of our estimators use a safety product known as Ladder’s Little Helper. Made in the USA, the device provides an anti-slip function when accessing the ladder and specifically prevents sideways movement while the Estimator is on the ladder. 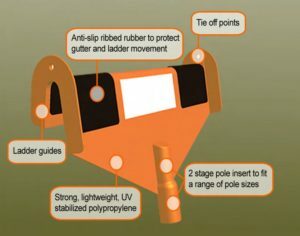 The device’s manufacturer claims the Ladder’s Little Helper fits 99% of gutters and 99% of ladders. 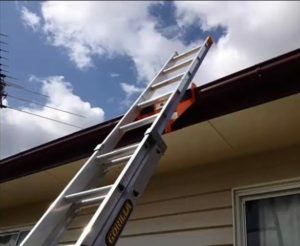 The other major benefit of using the Ladder’s Little Helper is it protects the gutter from scratching. To install Ladder’s Little Helper simply follow these three basic steps. Two things we have found very helpful that is not openly shown or discussed in any of the advertising material is the use of the tie off eyelet at the top of the Ladder’s Little Helper, meaning you can secure the ladder to the device and also by securing the bottom the risk of movement while on the ladder is greatly reduced, if not eliminated. 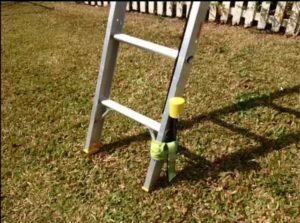 Ladder’s Little Helper is available at any Bunnings store and online. I love this blog! Thanks for sharing valuable information about ladders. Keep sharing this type of an informative blog.